A year ago, Melanie Camp worked long hours as an executive director for a division of Lockheed Martin, one of the nation's largest defense contracting companies. "You feel safe in the corporate world, with nice benefits and a good salary, so it was hard to leave," she says. "But after 20 years, it was getting to the point where the stress was always there." Today, Camp, 48, employs her corporate skills as the new owner of a bed-and-breakfast in Door County, Wis., on the shores of Lake Michigan. Many family members had already migrated to the area known as the Cape Cod of the Midwest, where Camp spent childhood summers. "It's a destination area where the only business opportunities are in retail, restaurants or lodging," she says. "I've always loved B&Bs so I decided to buy one." Camp took a seven-month leave of absence from work in 2010 to investigate her encore career. The first step was to meet with a Kinder Institute-certified financial planner trained to help clients discover life goals and manage finances to achieve them. "I took some tests, and it was the first time I saw my strengths and weaknesses on paper," she says. "I discovered that I like systems, order and numbers, but I was weak in mechanical dexterity." To learn about the industry, Camp joined the Professional Association of Innkeepers International and got access to online forums, webinars and industry studies. She also downloaded free templates from SCORE.org, a volunteer organization that mentors budding entrepreneurs, to create business plans, spreadsheets and financial statements. For an up-close look at an innkeeper's life, Camp shadowed the owner of the Brampton Inn in Chestertown, Md., an opportunity offered by VocationVacations, a company that offers brief exposure to more than 125 careers. "The VocationVacation gave me an inside view of the operational side of running an inn -- handling sales and marketing, the check-in process, purchasing food and supplies," she says. About half of those who shadow B&B owners abandon their plan of buying or opening an inn, says Brian Kurth, founder of VocationVacations. 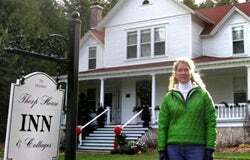 "The rose-colored glasses come off, and people realize that owning a B&B is a tough 24/7 job. You've always got people staying in your house." Camp was undeterred and signed up for an innkeeping 101 course offered by the B&B Team, a group of inn consultants and brokers, for advice on finding, acquiring, financing and operating an inn. "I learned that to have a viable business and make a profit, not just have a lifestyle, you need at least nine rooms," she says. "And an inn that size will set you back a million dollars or more." In Door County, she lined up a realtor, lawyer and accountant, and then zeroed in on Thorp House Inn and Cottages, a National Historic Landmark and setting for the bestselling novel Bitter Sweet by LaVyrle Spencer. The accountant provided another reality check, with less optimistic profit-and-loss projections. The inn's previous owners had done much of the routine repairs themselves, which Camp would have to outsource. "I had to factor those costs in because to have a viable business, not just make a lifestyle change, the financials have to add up," she says. "If the numbers don't close, your dream job is not going to work out." After the previous owners' bank helped with the financing, Camp took over the Thorp House Inn last year. "It only took me two months to find an inn to purchase. But it was another 14 months to finalize the decision, make an offer and close on the purchase." Camp kept the same staff and made few changes for the first six months. Given her long career in management, the business side of running a B&B has not been a challenge, but dealing with the public took a little adjustment. "You learn the customer is always, always right," she says. "You may have a logical argument for why they are not, but you have to meet the customer's expectations. That is key." Even on the days when she's unplugging a clogged toilet or slogging through mud carrying heavy porch furniture, Camp is convinced she made the right choice. "I took a huge -- I mean huge -- pay cut, but I'm so happy to be doing this rather than generating another PowerPoint presentation. I'm finally living the life I want to live." SecondAct.com contributor Elizabeth Pope is based in Portland, Maine, and frequently writes about encore careers, retirement planning and health issues.